Details from local newspaper "Hamshahri". 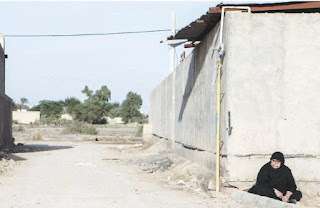 NIOC has confiscated lands of the villagers of Thadaeen in Ahwaz region.This village is located in north east of Ahwaz and has 2000 inhabitants. In early seventies 400 Hectars of villager’s land was confiscated, and they were compensated by only 0.004 Dollar for a meter, which by owners estimates mounted to nothing. Due to lack of education villagers gave their original ownership documents to NIOC and the oil company confiscated the land of people who did not have any documents of ownership as it belonged to the indigenous population for centuries. These lands were used for farming by the villagers according to customary laws of the village. NIOC built walls to prevent access by the farmers. After 10 years the owners complained to the courts but no measures were taken. According to the testimonies of “Naji Al Meskin" one of the locals the lands confiscated today by NIOC were used for agriculture. To prevent any action from villagers against the wall, the oil company hired some of villagers as security guards to protect the facilities. Despite of villagers objections, NIOC announced that they will established a golf club in the confiscated lands, and will continue with his project and are planning to organise a national golf competition. “Hafez Mansouri” another local inhabitant said that their land is divided to 3 part and , one of them has been sold with a high price to national rail company. “Hamad Baldi” one of the villagers added that non of the educated youth of the village is hired by the oil company and in addition our football playground is also confiscated by NIOC.